What would you do with 25 G’s? That question was posed to all legally blind people brave enough to submit their video to YouTube explaining exactly how they would use the money. It’s a contest sponsored by the San Francisco Lighthouse called The Holman Prize. Who is Penny Melville-Brown? * What is Baking Blind? You’ve probably heard of well-known explorers like Magellan, Columbus, Marco Polo? What about Holman; James Holman. Born in 1786 Holman went on to join the British Royal Navy and became lieutenant in 1807. In 1810he was struck by an illness that first afflicted his joints, then finally his vision. By 25 years old he was totally blind. He eventually decided to go on to study medicine and literature. Holman became an adventurer, author and social observer who circumnavigated the globe. Undertaking a series of solo journeys that were unprecedented visiting all inhabited continents. A Sense of the World: How a Blind Man Became History’s Greatest Traveler. Today is the first in a three part series where we meet the three winners of the Holman Prize. All applicants had to create a 90 second video describing their ambition and describe how they would use the money. A team of judges all of whom are blind reviewed each video and selected three winners. Let’s begin with one winner in particular, who you will notice, has several things in common with James Holman. Plus, I was taught, ladies first! Well I’m Penny Mellville-Brown and I live in Hampshire in the United Kingdom. My first career was in the Royal Navy. Why did you want to enlist in the Royal Navy in the first place? I needed a complete change of life. What were you doing prior to that? Well I was at university so I completed my degree. I done a postgraduate qualification. I was due to get married the following year and my fiancé was killed in a car accident so I decided that I needed a complete change. I applied for every job that was going that looked vaguely interesting and I ended up in the Royal Navy. think in those days the women had their own service so I actually joined the Women’s Royal Naval Service WRNS) and twenty seventeen is the Centenary of their formation. A barrister is a lawyer- mostly specializing in courtroom advocacy and litigation. Laughs, But not too much! and then within about a year of qualifying my eyesight started deteriorating. I struggled on for about a year or two and went on to do another job. And then it all got pretty critical and I was having to lose the sight in one eye or actually I was going to die so I gave up that I. Went back to work in the Royal Navy and then the other eye started going and then I got promoted but by that stage I probably wasn’t driving. I used to be on one of those great big old tri-cycles. Do you know what those are? You know a three wheeler bike and that’s how I used to I used to cycle around the dockyard the naval base, terrifying everybody. Penny’s vision loss was caused by Uveitis, a form of eye inflammation affecting the middle layer of tissue in the eye wall known as the uvea. Possibly another connection to James Holman. OH! I Can do that! That’s right! A can do attitude. Her response to going blind? I think I was really lucky. very little vision and that proved to me that I could still do as good a job as anyone else. Just because I was blind was completely immaterial. Did that take some advocacy on your part or were they just open to that? Oh yeh, I can hear that already! service organizations weren’t as helpful as expected. They didn’t know what to do with me. One just kept taking me out for lunch which was very charming but pretty useless. you find or create the solution. was a worthwhile goal that she could work towards fulfilling. PMB:so actually I took my uniform off one day and two days later I set myself up as a disability consultant and within a year I’d set up Disability Dynamics. So I spent lots of time helping employers with employment policies around disability. Serving on boards like the UK’s equivalent of the IRS and working with other governmental agencies was one aspect of Disability Dynamics, Penny’s disability consulting company. 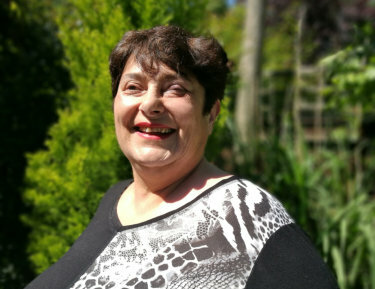 Working directly with people with disabilities, Penny found real joy and success helping others gain their independence. business that made them feel great again; independent, financially not reliant on the state and usually improve their health and it particularly improved their family relationships. Seeking a way to reach more people. Penny began with an idea sparked from something she enjoyed. I always make Christmas hampers for my friends and family. A hamper to me is where we put dirty clothes! Laughs! Here we would call that a dirty linen basket. A hamper simply put, is a gift of food. I was making at least fifty little Christmas cakes to go into these hampers and I thought well why don’t we video that. And just see whether this has got any legs whatsoever. My brother had some spare time so he came up and videoed it and I’d made some little Pewter Christmas cake decorations, so we popped those on the top and that’s how Baking Blind got started. This was late November early December 2016. Posting the videos to YouTube, Penny’s aspirations were more than sharing recipes. I was looking for something to demonstrate to others that just because you’re blind doesn’t mean you can’t do stuff. Me sitting on the board well perhaps twelve other people see that. Me delivering projects well perhaps five hundred people might know that. Yes, thank you for spotting that. That is, that is what it’s about. It’s getting real traction in the much wider population. Putting yourself in the public can risk being seen as seeking attention. Penny is very clear to note that this isn’t about her. She’s only 1 person who is blind, 1 person with a disability. there are loads more of us with all those capabilities who just want to do a good job, integrate into society, have a place in their communities rather than sit at home and be lonely and miserable. That’s one of the objectives of the Holman Prize; challenging the misperception that people who are blind are limited to four walls. Contestants vying for the 25,000 prize had a wide range of goals including establishing businesses, providing technology for others and even becoming president of their country. And there was me just saying Oh I think I want to cook some buns you know. But it’s so much more than buns! How exactly are you going to fulfill your mission using the Holman Prize. the idea of whether we could do dining in the dark down there. And I said well actually I think he I want him cooking in the dark. Then I’m going back to Virginia Beach and I particularly welcome anybody in the Virginia Beach area to get in touch who might like to do some cooking with me. They don’t have to be blind it could be anybody. And I’m looking for professional chefs to. the washing and catch up on some sleep. Then I’m whizzing over to Chongqing, n China where I’m going to be working with the Rotary Club there who are already running a project to help local visually impaired people. food from but from the bush and then you turn that into something my fingers are crossed edible. Not too wriggly and creepy crawly. Then I’m going down to Melbourne and I’m already linking up with another Blind Cook down there. Then I’m going on from there to Malawi and then back to the U.K.
And then I’ve got a whole program of more activities back in the U.K. particularly exploring some of the things that James Holman and might have understood and recognized. Because of course I worked in the Naval Base, the dockyard and many of the buildings he might have known. His ship was just on the other side of the water Portsmouth here in Hampshire. We’re going to make videos all the way through. So I’m hoping to publish a video every week for a year. And they’ll be blogs and of course all the recipes. What would you do with 25,000 dollars? ideas aren’t worth anything by themselves. I’d imagine that , contestant’s ideas were only a part of how the winners were determined. I think it’s more like investing in the person. You want someone who can show the ability to see things through. A lot of people have the idea , but then they don’t make that step. How did you make the step? I did say I was a bit determined didn’t I.
a metal mixture that includes mainly tin. I design buildings as well. I’m sitting in my conservatory which I built as a birthday present to myself. I had it very clear in my head what I wanted and I have this great architect. We designed it absolutely right down to where the power sockets would go on the walls from my head. Then he built me a little cardboard model so I could check that he done it right and now I’m sitting in it. Or your legs, your mind… you get the point! Unfortunately, not everyone believes that’s true. And too often those who lose their vision internalize these misbeliefs. Yes, adjusting to blindness or any disability can cause depression. This could lead someone to feel their creative lives are no longer an option. Penny offers additional insight and an approach to slowly breaking through. Much more of it is about the social isolation. The fact they can’t work. They’re sitting at home, they’re poorer, their health is suffering with that extra depression. That place to me, where I think they think they are, is a very scary place to me. Well status quo bias is where you believe that where the condition that you’re in at the moment is safe and secure even though that condition may be quite miserable. And even if people demonstrate to you the benefits of making change you still resist it because you have that bias towards the status quo. Here in the U.K. if you’re unemployed you may be in receipt of government benefits to help you live and people. feel that that safe and secure because at least they know they’ve got some income for the foreseeable future. And to break through that. Into it explain to the matter if you’ve got a job you’d be happier if family be happier your health would be better and have more money. It’s still getting across that big jump. Which is quite tricky for them and so the answer is you take in very small steps very small incremental steps so that at no stage are they having to make a huge decision to make that break from benefits into work. You help them make it gradually so that they’re not being faced with huge risk. The driving force behind I’m going to stick where I know I’m safe is very important but let’s just expand that area of safety so that it’s a bit more ambitious in the longer term. Yeh, just dip the toe… dip the toe in the water! prove to be a real benefit. Something I had to learn myself. people miss that huge advantage of being slightly vulnerable relying on somebody else and the benefit you get out of it. The number of delightful people that I meet and the bonding you get supportive bonding you know it’s a joy. I travel down perhaps I’m Darbyshire and they’ll be eight people that I will meet on that journey all of the other people traveling just passed their ticket to the ticket collector and don’t speak to anyone. I’ve had all that delight in that person interaction all that way. For me I know for a long time I was thinking that the first way, just passing my ticket and being quiet was the best way. And I have to remind myself that no this new way actually probably is the best way. Baking Blind is a winner of the Holman Prize because Penny as a history of making things happen. That’s just one reason to be a fan of Penny & Baking Blind. Plus there’s that ability to adapt, the desire to create using what she has not wanting for what was lost, going for big goals like changing how the public views disability. And of course the laugh! If you’re interested in cooking with Penny go ahead and drop her an email at Penny@BakingBlind.com. Which is where you can find more about Penny, follow her journey and of course grab some recipes. thought about entering. the truth is I really didn’t have an independent ambition. I wanted to tell the stories of the winners. But who knows, maybe the future has something like that in store. For now, I have Face Time, I have Skype and if that’s what I have to do then it’s all good baby! Isn’t that the Holman spirit! Penny, like Holman, could have easily taken that Royal Navy Pension and sat in her chair and found some other way to entertain herself. Sorry it’s just such a great hearty laugh I couldn’t resist. Make sure you visit and subscribe to Baking Blind on YouTube. All the links are on the blog post accompanying this episode on Reid My Mind.com. a man who is planning on Kayaking alone from Europe to Asia. And no he’s not crazy! how he’s directly changing the lives of others who are blind. Make sure you subscribe to this podcast so you don’t miss these episodes. Apple Podcast, Google Play, Stitcher, Tune In Radio, Sound Cloud! And if you like what you hear on the RMMRadio, give a brother some love by leaving a review wherever you download the show … especially Apple Podcast. You know they say, Podcasters need love too! Posted by T.Reid	on Sep 13th, 2017	and is filed under Accessibility, Advocacy, Audio, Blindness, PWD.